What would happen if physical objects around us could be enabled so they could change their shape? What kind of interactions and applications would become possible for these devices that dynamically deform and change their physical appearance in response to the user’s actions? Lumen is creating and investigating an interactive device that can dynamically change its shape to communicate information to the users. 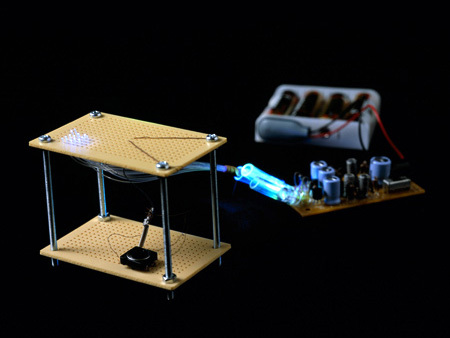 The device uses interfaces that can be generalized as an extension of traditional 2D bit-mapped RGB displays. Here each pixel has an additional attribute: height. This interaction design approach is called an RGBH display, where RGB is the color component and H is a height of a pixel. It can be viewed as the next step in the evolution of a pixel. Lumen is an implementation of such an RGBH display: it’s a low-resolution (13 by 13 pixel) bitmap display where each pixel can also physically move up and down. Therefore, the device can display both two-dimensional graphical images and moving, dynamic 3D physical shapes. These shapes can be viewed or touched. Invisible to the user is a two-dimensional position sensor (SmartSkin) that is built into the Lumen surface adding interactivity to the device. It allows users to directly manipulate and modify shapes with their hands. Furthermore, by connecting several devices over the network there can be a remote haptic communication link between several users. Dynamic physical shapes add another interactive dimension to 2D images. Shapes can be used to increase visual realism by adding shape and real-time physical animation. For example, an animation of floating water can be displayed by creating a physical 3D wave sweeping across the display surface. Similarly the movement of a virtual character can be made more realistic by displaying parts of a character though the shape: for example an image of a fish swimming across the display can be combined with a physical shape of its fins “sticking up” from the water. Alternatively, shapes can be used to present fine irregularities in surface and create physical textures and patterns. Users can physically create and manipulate virtual images using sensor installed in the Lumen surface: for example a physical wave can be drawn by moving a finger across the surface of Lumen. In another example, physical interface elements, such as buttons, can be dynamically created and “pressed” by the users. By connecting two devices over the network we can allow several people to feel and touch each others remotely, establishing a remote haptic link between people. Shape displays also create new and beautiful aesthetics through 3D physical motion and images. To create an image, Lumen uses guides that direct light from the LEDs mounted on the bottom of the device. The tops of these light guides are covered with matte cups that diffuse light and produce even illumination of each pixel. Each pixel is actuated using thin shape-memory alloy (SMA) wires that are attached both to the light guides and the frame of the device. When electrical current is applied to the SMA wires, they heat up and shrink pushing the light guides up. They return back to their initial length when cooled. To provide interaction, a custom two-dimentional capacitive sensor (SmartSkin) is integrated into the Lumen surface. The sensor computes the shape of the touch area and a distance from the hand to the device surface. This data is used to update the state of the Lumen device. Lumen is an early and conceptual interactive prototype that allows us to imagine and propose future interfaces. With the development of new, lightweight, energy-efficient and inexpensive actuator technologies the development of thin, fast and effective shape displays that can be used in public displays, electronic appliances, living environments and mobile devices. Perhaps, the most prevailing robots in the future will not look like a human or animal, but will rather a dynamically reconfigured surface that would present information though images and dynamic physical shapes. Lumen is one of the first attempts to probe this future.